An infusion of tulsi. Invigorating and zesty grapefruit subtly melds with stimulating eucalyptus; fresh Malagasy ginger gives warmth. Energizing. An infusion of amalaki. The tropical smell of coconut merges with uplifting Malagasy lemongrass and the refreshing tingle of peppermint. Cooling. An infusion of ashwangandha. The soothing almond scent is complemented with notes of spicy Guatemalan cardamom and finished off with a lovely lingering of Turkish rose. Grounding. 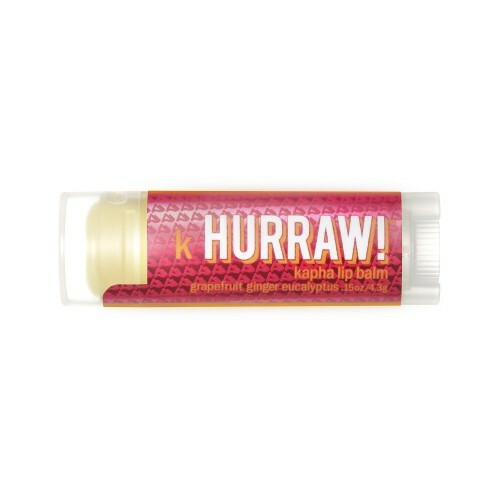 Hurraw balms are all natural, vegan, made from premium raw, organic and fair trade ingredients... complete with a bunch of natural and fun flavour options! They are super smooth, not draggy, not sticky, not sweet, not too glossy, not too smelly, never grainy, long lasting plus they won't melt in your back pocket. Hurraw infuse rich, cold pressed organic sesame seed oil with plants, fruits and roots known to complement each Dosha. Next melt in creamy raw organic coconut oil, rich raw organic cacao butter and emollient cold pressed organic castor oil. Then mingle in a trio of flavours from pure essential oils and all natural flavour extracts to create a unique, long lasting, very nourishing lip balm.